It wasn’t exactly the best way to ring in the New Year, but last night I dragged M to Northwest Film Forum to see the three-hour documentary The Autobiography of Nicolae Ceausescu. Absent of narration, the film is a collage of propaganda from 1965-1989, book-ended with clips from the show trial that preceded his and his wife Elena’s execution on Christmas Day, 1989. Throughout the film, pompous news reel music, chants, and clapping alternate with eerie moments of crackly silence. One of the most memorable clips, for me, showed Ceausecu beside Mao Zedong, not quite knowing what do with himself. There is also a technicolor dazzler of a tribute in Pyongyang, at which Ceausecu and Kim Il-sung gaped gleefully. It was certainly an interesting experience gleaning what I could from the juxtapositions of images, such as the gradual but palpable shift in the filmed crowds from fanatical support to grim and nervous half-smiles. This weekend I picked up a copy of Henry Miller’s Big Sur and the Oranges of Hieronymus Bosch. Looking forward to dig into that one. 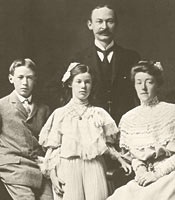 In the meantime, here’s a lovely post about Miller’s childhood in Brooklyn. I do wonder how one played “cat” or “shimmy”! “It’s strange what a little boy remembers of his early life,” wrote Henry Miller in a 1971 New York Times essay, nine years before the death of the author of Tropic of Cancer and other great 20th century novels. 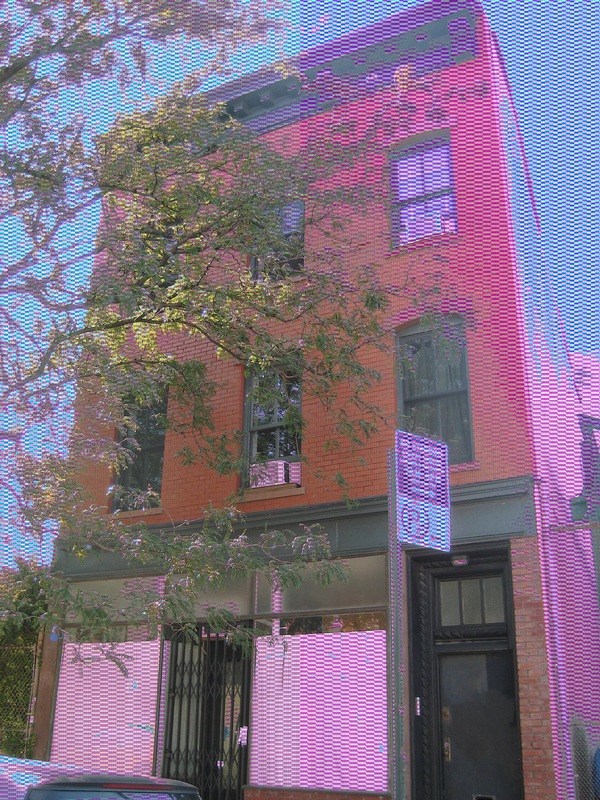 Until age nine, Miller lived with his family (at left) at 662 Driggs Avenue (below) in Williamsburg. His memories of what he deemed his “sojourn in paradise” offer fascinating glimpses of life through a kid’s eyes in 1890s Brooklyn. Medieval medicine and quackery has been slowly piquing my curiosity. Perhaps it started in Freiburg in 2003, where I took in an exhibit on the history of trephination, a peculiar if somehow logical cure for all manner of headaches and madness. Hieronymous Bosch, incidentally, warned against such quackery in his painting “Extraction of the Stone Folly”. But there is a less gory and more charming side to this era in medicine. Yesterday, while visiting the Cloisters, I learned a great deal about the medicinal herbs kept in a monastery as well as general medieval beliefs about health and beauty. Should you find yourself plagued with freckles, for instance, you can rub them right out with honeysuckle. The poisonous, paralyzing belladonna plant could be used in small doses as a general anesthetic – this might have been what Friar Laurence gave Juliet to fake her death. Women ate figs, strawberries, pomengranates, and other many-seeded fruit to increase their chances of conception. 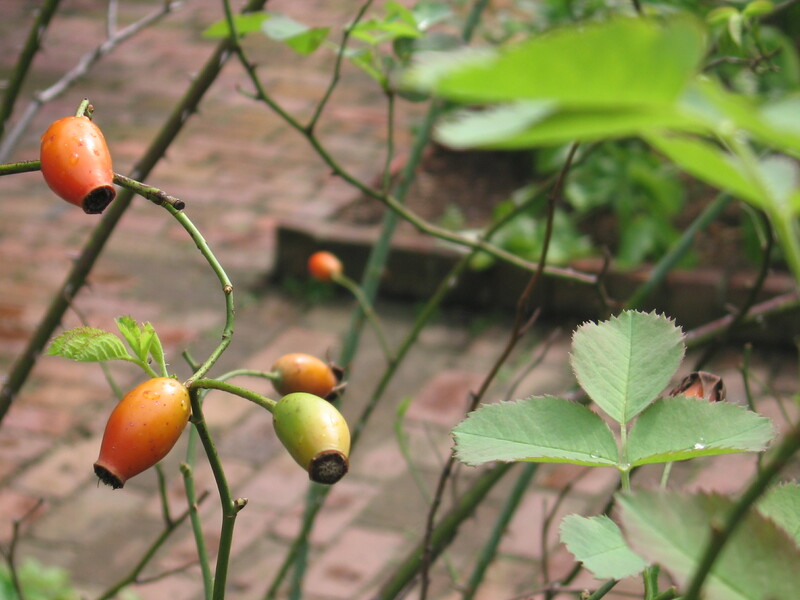 And rose hips and other parts of the rose were believed to shrink tumors (and/or pimples); but there may have been something to this, because apparently some aspect of this plant is still used in chemotherapeutics today. In other botanic news, I finally saw the second installment of the High Line. It certainly has a wilder look about it, with metal walkways overlooking dwarfish trees with large leaves; they seem somehow prehistoric. And there is a large abundance of some very fragrant herb. The scent actually made me a little sick, so I had to hurry away before looking into what it was, but I’m looking forward to returning in another season, when other wild plants take precedence. The closed off, still uncultivated third section of the High Line seemed more intriguing to me than the newly opened portion. That spur along 30th Street won’t be open for another five or six years. Stay in the loop! Sign up here for a short & sweet monthly newsletter of upcoming events, publications, and tiny bits on art, botany, food, cities, and literature. Like this blog, but less often and right in your inbox.